A couple of posts ago as I presented a piece using words by American poet Henry Wadsworth Longfellow, I mentioned that his prestige has fallen greatly. And Lewis Mumford sums up his significance with a dagger by declaring that Longfellow could be completely removed from the history of literature without much effect. Furthermore, while there’s no modern bon mot to extract from the Wiki, Longfellow’s didacticism, a huge defect if detected in modern poets, is noted. Even during his lifetime, that rankled the Transcendentalists, always looking for the more inexplicable sublime. Akin to one our Parlando Project principles, Longfellow took the idea of “other people’s stories” to what are now considered ridiculous lengths. Instead of writing of intense internal experiences as Emily Dickinson did, or expanding the fleshy personal into a democratic universal as Whitman did, Longfellow wrote about many cultures and translated poetry from many languages. The term “cultural appropriation” didn’t exist as such then, but Longfellow could easily be charged with it. His best-known epic poem, Hiawatha, which has left its imprint all over my own region’s place names, is an earnest and non-hateful mishmash of the mid-19th century’s limited knowledge of indigenous Americans mixed with some contemporary to the time German romanticism. Longfellow would be a cultural criminal if he hadn’t already been reduced to a laughingstock. OK, so what. All of these charges are true, but here’s what they leave out. To say Longfellow was “an American poet” is like saying Elvis Presley was a rock’n’roll singer. He proved that could be a thing, that an “American poet,” could connect successfully with a wide audience. He imitated Europeans and English romantics. Yes. Who the hell else was there to imitate? He wasn’t as original as Dickinson or Whitman. Yes, and neither is most any other poet you could name, now or then. And Mumford’s dagger? Alas, that can be said of most writers, because literature is a vast swarm of similar literary genetic ideas, but if there wasn’t a Longfellow, someone else would have to establish the idea of a popular American poet. That alternate-history someone else might have been good or bad, but it likely would have lead to some difference, even if the difference would be some other writer to rebel against. I too wish Longfellow had tempered his didacticism, even if that is a large part of what made it possible for him to succeed. Most Victorian poets suffered from this as well, and it’s part of what the Modernists sought to break free from. To the degree that we are now Post-Modern, we can reassess this. Can poetry stand for something and still be art? If that is difficult to do, should it still be attempted? Today’s piece is an example of Longfellow seeking to instruct, and the charge of cultural appropriation could be leveled at it too. In 1842, as opposition to slavery started to gather force in the United States, Longfellow wrote a short collection of poems on the “issue”—yes, human slavery, for and against, it was a debate. Longfellow explicitly released this collection for publication and distribution in support of the anti-slavery cause. The obscenity of human jetsam. I learned about the Zong case only this year while traveling in Britain. “The Witnesses” is from that collection. In it I think Longfellow transcends propaganda for this noble cause and demonstrates his effectiveness as a poet. He audaciously takes the notorious Middle Passage of over-sea slave shipment as his subject here. 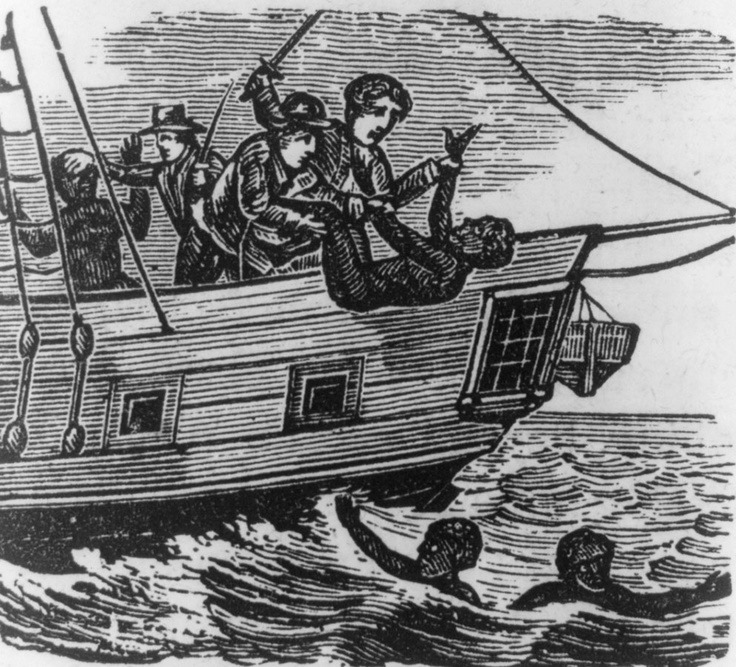 Though those travails were not his personal experience, the obscene losses at sea in the shipment of chained-up human beings is portrayed. I chose to further highlight Longfellow’s concluding phrase to all this. “We are the witnesses!” he writes, as the still shackled skeletons speak in his poem—but of course, un-romantically, their remains cannot speak. The poet, the reader, the performer, the listener, are the real witnesses here. A short note. Wouldn’t you know it, after spending a good part of this year exploring the early 20th Century Modernists, I now have been using 18th and 19th Century sources more this summer. One of my favorite blogs, My Year in 1918 recently noted how I was tackling those WWI-era writers with my musical pieces for her readers who might want to sample that. Well, I’ll return to those literary Modernists soon. After all, a principle here is to try to mix things up, to not be predictable or to always rely on my established favorites. But even today, I think I’ve been tipping my hat to another key early 20th Century American Modernist. As I was writing and performing the music for “The Witnesses,” with its variations on folk-style melodies that twisted between strains and finished with a louder cadence that didn’t resolve the multiplicity, I asked myself “Where’d that come from?” Early this morning it occurred to me: the composer Charles Ives, who was working at almost the same time as those literary figures. If he had access to an electric guitar he could have been Frank Zappa. Once more I’ll break with my usual practice and apologize that I don’t feel I’ve fully realized this audio piece, mostly because it really should be performed with a number of featured voices and a chorus. While my computer and inexpensive collection of “virtual instruments” lets me reasonably realize a large number of instruments, it cannot represent vocal works very well. Go ahead and listen anyway, and if you can listen on speakers instead of earphones, crank the volume a bit.